Ever since we bought our home, I’ve wanted to change out the blah exterior lights to more upscale copper versions. The only problem? Some of the copper light fixtures I had my eye on cost $200 apiece! 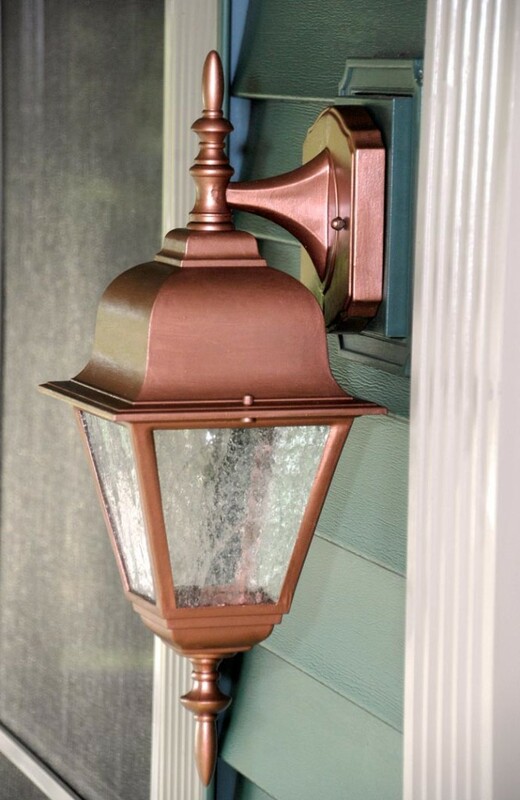 Fortunately, I discovered an alternative, thrifty way to make my outside lights look like a million bucks using Modern Masters Metallic Paint in Copper Penny (MM579). Modern Masters recently contacted me and asked if I would be interested in reviewing their products and offering a giveaway to my readers. 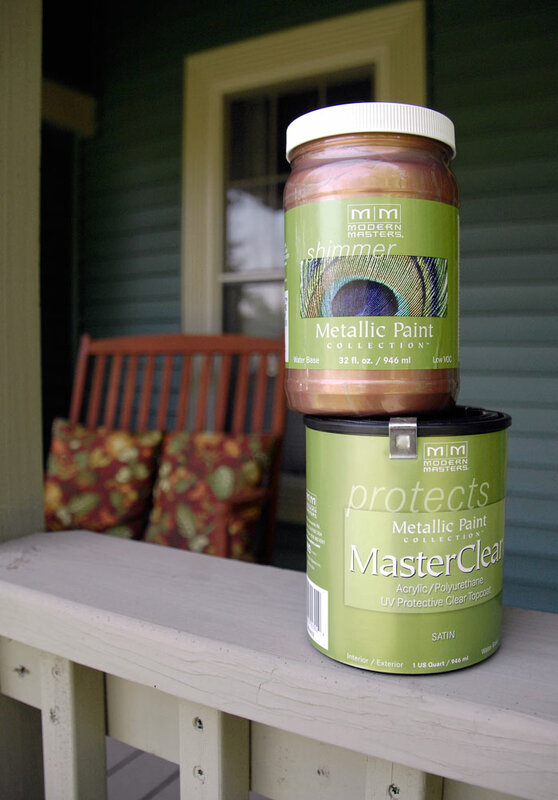 When I discovered they had a metallic paint line that could be used for both interior and exterior projects, I was sold. I requested the copper penny metallic paint and also received a can of their UV protective clear topcoat (satin finish), MasterClear® Supreme. This topcoat is specifically made to not dull metallic paint. I started the project by taking down a light (the hubs made sure the power was disconnected before handling any electrical wires). Then I primed it with an appropriate spray primer. After that, I brushed on two coats of the copper penny metallic paint. A little bit of this product goes a long, long way. You can see I barely used any of the paint in the container. I found two coats to be adequate for this project. One of the many things I love about this paint is that it covers well and dries quickly. You can recoat after only 30 minutes and it is dry within one hour. It is recommended that you wait 24 hours before applying the acrylic/polyurethane topcoat, however. This paint has an impressively realistic copper finish. I also love that it has low volatile organic compounds (making it less harmful to humans and the environment) and cleans up easily with soap and water. In addition, you can brush, roll or spray on this paint, depending on your preference. My sprayer pooped out on me awhile back, so I used a brush instead. 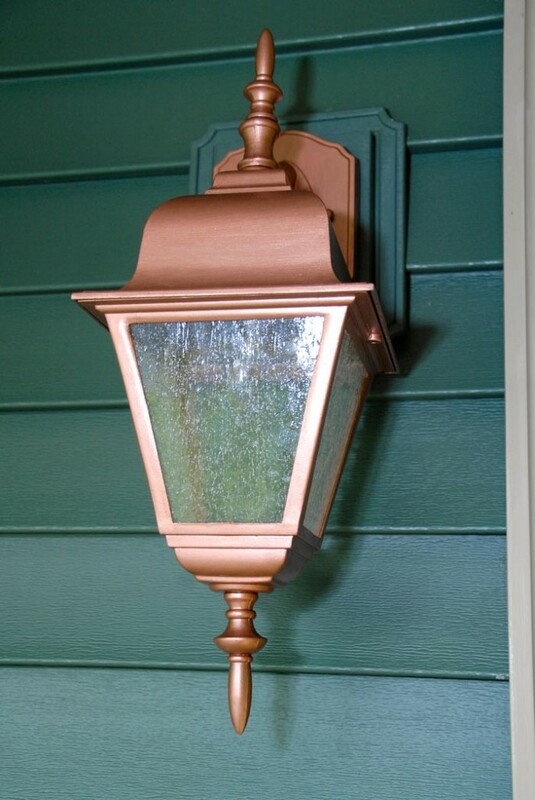 You can see why copper was my metal of choice considering my house colors and porch decor. Metallic Paint Collection (One quart and six-ounce container – any color; or four six-ounce containers – any colors); or a Metal Effects Kit. Don’t forget to come back next week and enter to win! I’m linking this up to Shabby Creek Cottage, Love of Family & Home, My Repurposed Life, Obsessive and Creative and Domestically Speaking. 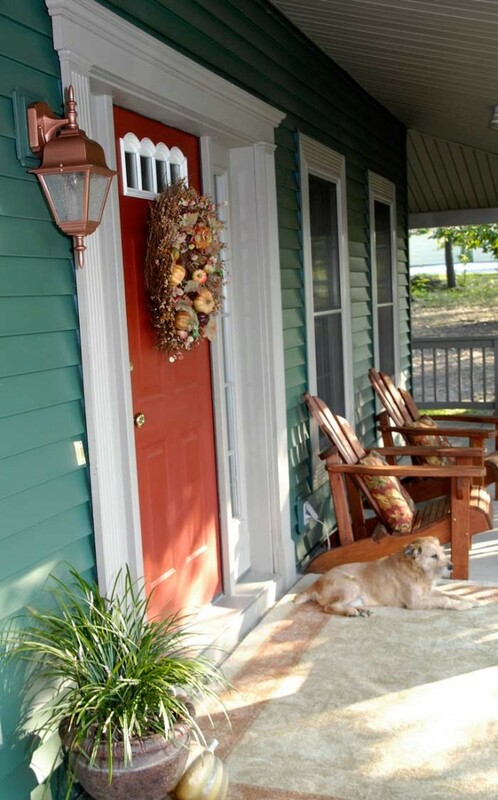 This entry was posted in Exterior, Frugal living, Reviews & giveaways by Susan. Bookmark the permalink. Looks awesome, is this product available on the open market? or just through the mail? You can look for a retailer here: http://modernmasters.com/wtb.asp?type=1. Or you can also order it directly online here: http://shop.modernmasters.com/. Thanks so much for stopping by, Cyn. Looks great Susan! I also love the picture with Howie!!!!! Thanks for stopping by the website, “Mom High.” 😉 I hope all is well with you and Brent. We hope to see you again soon. Thanks so much for the beautiful pictures. Maybe that is the kick in the pants I need to finally start framing some family photos around here. Love ya! I absolutely love it, you done a terrific job . THAT! is gorgeous… I am totally sold. Wow the new light looks so pretty with the green siding and your red door. Awesome. Sure could use that paint on many projects. How many more outside lights are you going to transform? Your neighbors will think you won the lottery. How great to get the paint free. Jane Ellen, I have 5 more lights to do, so I’ll be busy for awhile. 🙂 Thanks for the kind words. Yes, that rug is our dog, Howie’s, favorite spot to lie and keep an eye on the neighborhood. Looks great with the red door. ERMERGERD!!! Love it! It looks so great! little bit of work huge impact! Fantastic! I have been pondering this exact project. How did you remove the glass from the light? Did it just pop in and out easily? Thank you! It’s easier than I thought. Once the light is removed from its base, there should be a few screws attaching the top to the bottom. These can be easily loosened; the top pops off; then each piece of glass slides out. They are not permanently attached. I think most fixtures are set up this way so bulbs can be changed out and the glass can be cleaned. The glass is loose so the panes can expand and contract with the heat of the lightbulb. And vent the extra heat. Thanks for the info! I did not know that. Susan, so happy you linked up to MRL catch as catch can. 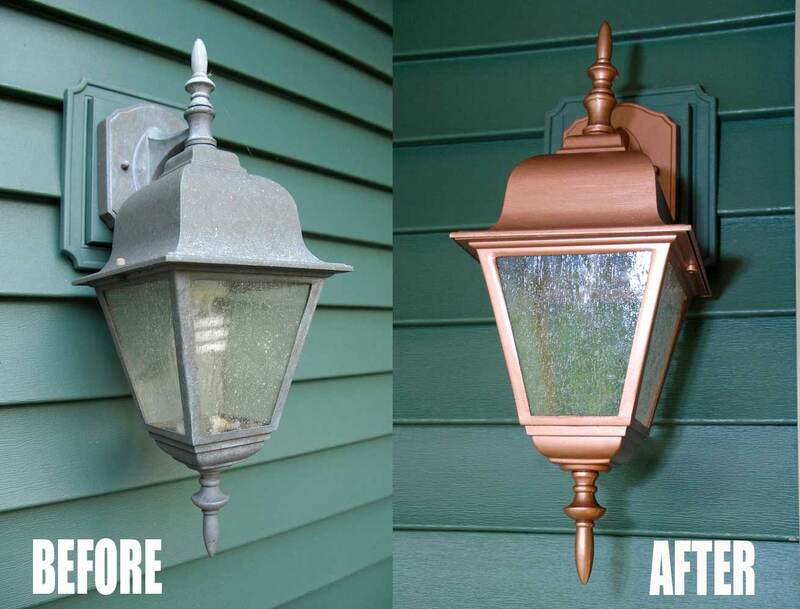 What a great transformation of your exterior light fixture! LOVE it. I saw your wonderful light on My Repurposed Life. You should come party with us starting at 9:00pm cst tonight. http://obsessiveandcreative.blogspot.com/2013/08/craft-frenzy-friday-2.html Come by and link up! 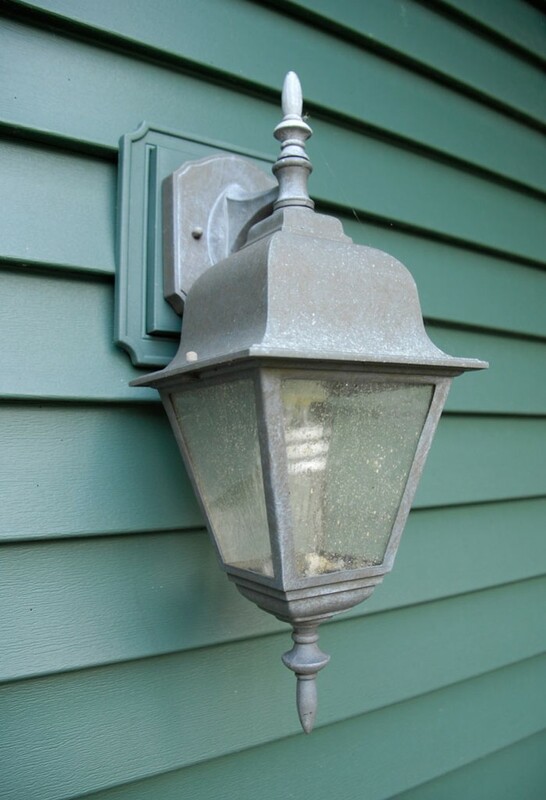 Susan, Great job on fixing up your exterior light fixture. It really looks brand new. I have similar styled light fixtures, but mine were a shiny brass at one time, and now are pitted, and gross, rusty looking. Do you think this product would work on a fixture in that condition, or should I bite the bullet and purchase new? Linda, I would give it a shot with your old fixtures. You may want to use a wire brush or steel wool/sandpaper to get off any loose rust first. 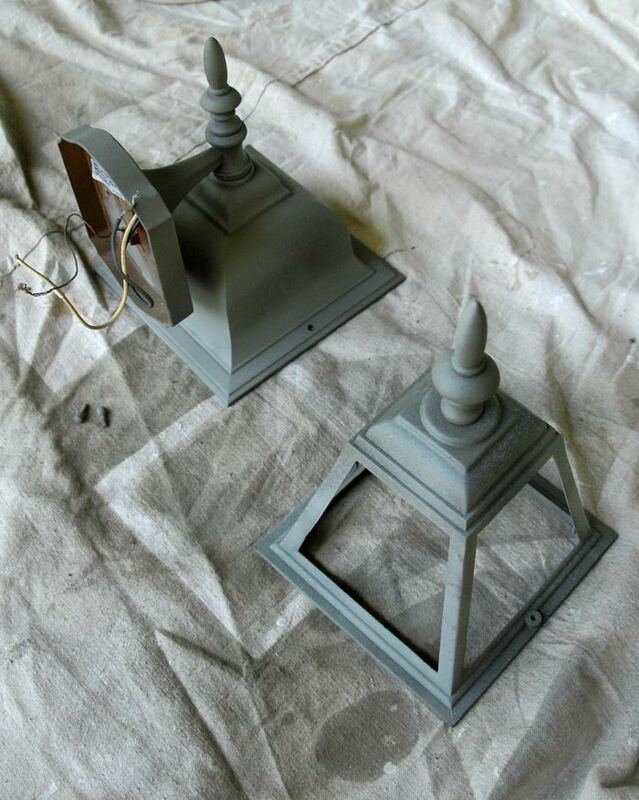 Then use a really good black primer and you should be good to go to apply the metallic paint. I did this with a rusty table I refinished for a patio set (http://livingrichonless.com/final-reveal-my-160-diy-patio-set/) and it worked great. 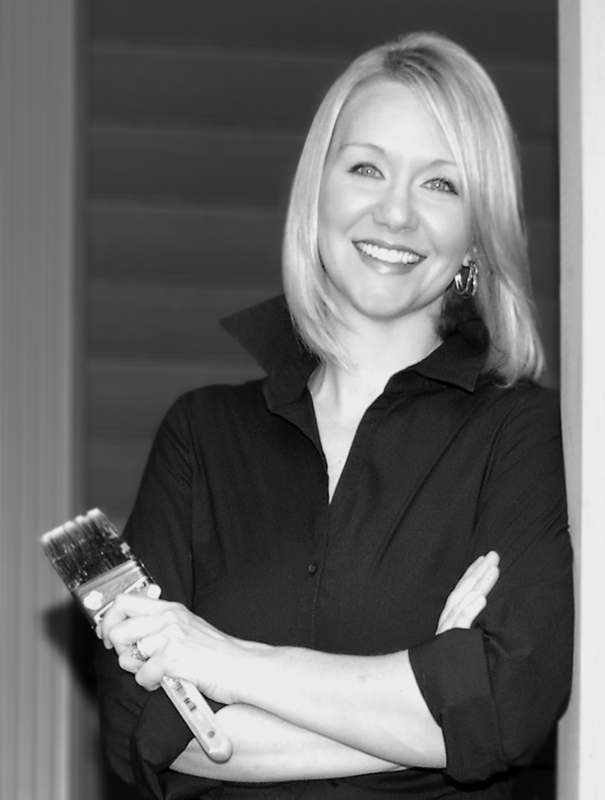 If you haven’t already, be sure to enter to win the Modern Masters paint of your choice on my blog. Thanks for stopping by and good luck with your light project. This looks great! Thanks for posting on Craft Frenzy Friday! 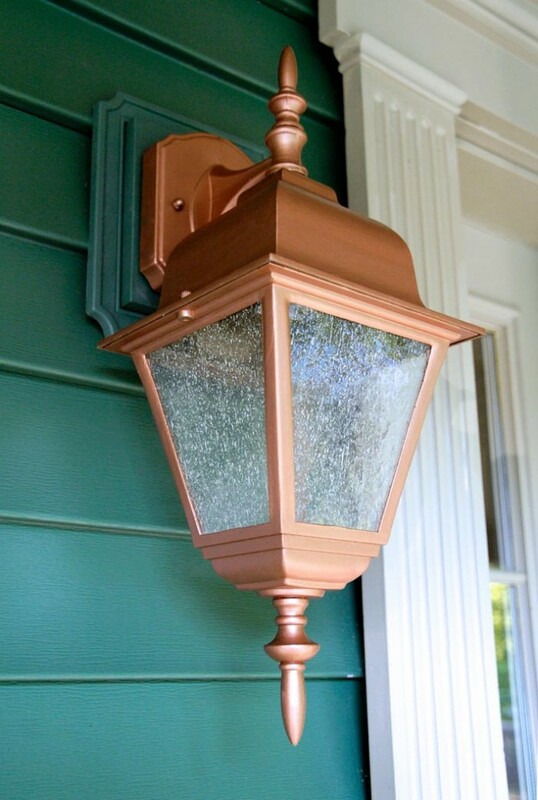 I like some of the spray paint that looks like ‘stone.’ That seems like it would be an interesting take on outside fixtures. Maybe, or a pole light, a ‘stone’ pole and metallic light? or, cover the pole with a wooden ‘box’ painted like stone (roughed up to looked like chiseled stone after being painted). I love taking old things and reusing them. I got a 2nd hand modular house – the problem with them is that they’re sized different than regular houses. The back door was cheap – nothing more than a 1 – 1 1/2″ piece of foam with thin plastic covering it and it was falling apart. I had a couple of old doors, one had a good window, the other no window. I cut the window out of the bad door; cut down the ‘good’ door to fit; cut the window opening a smidgen larger than the window from the bad door. I framed the opening on one side with 1/2″ lattice, put clear calking around the opening (to help hold the window and to stop any air leaks), slipped the window in and put more lattice on to frame the other side. I painted the door white and used paint that matched the siding to accent the design on the door and on the wood around the window. I used it for years until I moved. Wow, Jan. You’ve definitely earned the title of DIY diva. Linda S. Described my light fixtures, and I read your instructions. Don’t know if I’m brave enough to attempt the do over. Would the copper look ok on red brick, or should I try black metallic since the porch has black wrought iron banisters? 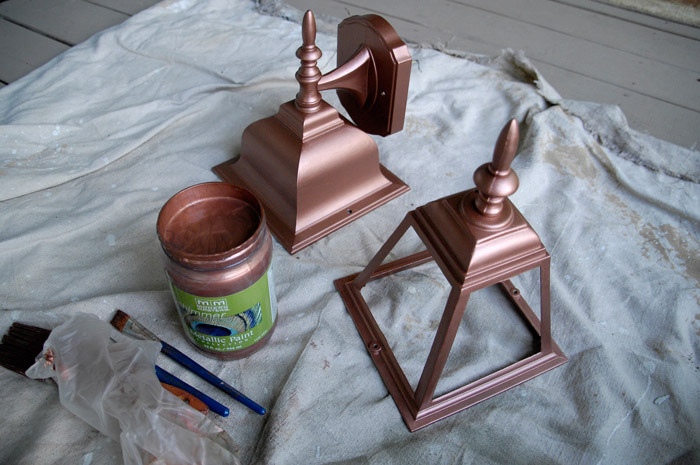 The consistency of the copper paint is thicker than water, easy to apply, and dries easily. I brush-coated these lights because I didn’t have a paint sprayer and I was impressed with how that last coat made every single brush stroke disappear. I would consider this some of the highest quality paint I’ve worked with. As far as the clear topcoat, I had no issues with it. It provides a satin finish (minimal shine), which I like, dries quickly, and has a UV protectant to keep it from yellowing. What was the primer product that you used? There’s just so many to choose an I don’t know which to use! I love Rust-Oleum black spray primer. It’s my go-to for everything. I’ve even used it to prime door knobs. The durability is great. What kind of weather conditions do you have at your house and how has the paint held up? The product description for the Protective Clear Topcoat states that it holds up to UV, but it doesn’t mention weather. I’m from the Midwest, so it would be hit with pretty much all of the elements – rain, snow, wind, heat, etc. I live in the woods on top of a ridge, so we get it all … rain, wind, snow, hail. LOL. The finish has held up perfectly! Hello! Can I use this metallic paint on my front entryway door??? Not entirely sure but I will say this paint has held up perfectly on my lights … no chipping or fading and it’s been years. It’s fantastic. I’d give it a shot!